Binondo throbs vibrantly while strolling along its filthy, narrow alleys. The rays of the sun kiss the humungous red bloody arc emblazoned with dragons and Sinitic calligraphy when we arrive at the mouth of the famous Chinatown in the city. My wife and kids’ sudden immersion with me certainly awed and struck them, telling me in gist, as if they reach Beijing. 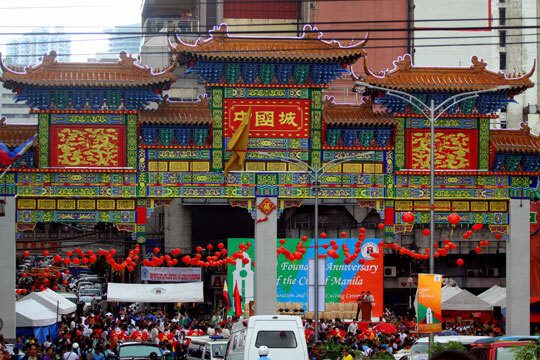 Since Binondo is the earliest Chinatown to be established in the whole world, it probably has the largest concentration of Chinese population in Metro Manila or around the archipelago. Most of the Chinese in Binondo belong to the third generation of Chinese immigrants. They own business establishments in the booming area, flamboyantly exuding their expertise on entrepreneurship. The abundance of Chinese businessmen in Binondo could be traced back from the Spanish colonial era where it became a place to confine to the ever growing Chinese population. Though initially of low status, the Chinese slowly gained the confidence of the Spanish officials since they heavily contributed in the Philippine economy as the Spanish empire began reforming its colonial policies. Binondo as a political unit has been very attractive to Filipino writers for it can actually expose a different political take under a modernized Chinese community in the heart of Philippine political culture. Aside from the economic reverberations of Binondo as the earliest Chinatown in Asia, where extensive trade and commerce prosper, it also captures a perfect picture how culturally-different the Chinese community as a political unit can adapt to a larger and stronger political environment. The extent of why political culture of the Filipino-Chinese community in the first place matters in the larger Philippine political system is on how such new political system may actually influence a traditional one. Another worth noting in this political dynamics is the flexibility of Chinese strict economic purpose to be subsumed by the need to extend politically side-by-side with their intentions to constitutionally orient their local bodies. The alien Chinese population of Greater Manila was officially reckoned to be big in number. Defined in cultural and not in legal terms, whether they be Filipino citizens or not, full-blooded or not, they are distributed throughout all of the metropolitan area, but they tend to congregate in their own enclaves. As they create their own identity, the descendants of the mythical dragon who settled in the Philippines, shaped by history and community, would later ascribe to call themselves Chinoys or Tsinoys (Chinese Filipinos). Lesson # 1: As I converse with one local official in Binondo, I have learned that the place is not actually a Chinese community if residential population is to be considered based from walk-in interviews. A Chinoy discloses that most of their voters are Filipinos who are said to be either natives of the Binondo area or employees who decided to reside there permanently. I have been in Binondo a lot of times before. But still, I cannot forget the feeling of excitement that caught me and my kids when we started immersing ourselves in Chinatown. When we went there to observe, we did not just gain knowledge of how the people live in the place, we also have our senses fed. Its mixture leads us to imagine ourselves in a new experience. Our eyes have savored the wonderful architectural designs; a whiff of the different scent that the place gives off. But as language learners, I have felt amazed again with the language, I thought at first as thorny and difficult. There is excitement of going and exploring the place but at different levels; it feels like we are exploring a whole new world, but of course the adaptation of the people varies differently. After surveying the area, the languages spoken in Chinatown are mainly Filipino, English, and Fookien. Filipino and English are heard in the area because these are the languages mainly used for non-Chinese in the community. In communication, local Chinese prefer Fookien in speaking to their fellow Chinese. Fookien is a Sinitic language from Fujian province in China; most of the Chinese community here in the Philippines come from that island-province. However, most of the Fookien speakers found in Chinatown are mostly elders. The second and third generations of Fookien speakers are now using English and Filipino in everyday communication, making them to have a less command of the Fookien language. The reason, in Chinese society, Mandarin is a prestige language. It is more often used in formal settings like in schools, the media and business. To be able to speak Mandarin is a sign of good education and a higher social status. In Chinatowns where you would find people coming from provinces in China and where the language demands a colloquial setting, regional languages are preferred than Mandarin; so with the case of Binondo. However, you would still be able to find Mandarin-speaking Chinese in Binondo. In Binondo, the Chinese writings that are used are in traditional Chinese. Traditional Chinese characters are more complicated than simplified Chinese characters. They are preferred when writing signs and doing calligraphy in Chinese because of its intricateness and aesthetic value compared to simplified Chinese characters which have less number of strokes, and are plain to look at. Since simplified Chinese characters were instituted during the 1950s by the Communist government of China, the Chinese in Binondo who settled there even before 1950s until today have been using the traditional Chinese writing system. Lesson # 2: When we went to Lucky Chinatown, a sprawling middle and high class shopping mall, I have heard a lot of elderly Chinese conversing in Fookien. If you are an outsider, you would expect Mandarin to be the preferred language in a Chinese-speaking community like Binondo, but in most Chinatowns around the world, you would hear more people speaking in a regional language like Cantonese or Fookien but not Mandarin. The fierce glare of the sun combined with smoke from vehicles choked in heavy traffic, has led us inside the beautiful church named after the first Filipino-Chinese saint, Lorenzo Ruiz. As we enter, I feel amused with the angelic paintings on the wall, as I submerge my fingers in a bowl of holy water. In my rumination to better know the church’s history, I have great conversation with Reverend Fr. Luis Sierra, O.P., who has toured us around the church. The modest church looks like a chapel for me with over thirty pews, small confession boxes annexed to the wall, and the imposing statues of Jesus, Mother Mary, Saint Joseph, and San Lorenzo Ruiz – the patron saint of Binondo. Because of religious syncretism apparent in the culture of assimilated Chinese in the Catholic faith, some religious image looks like Chinese particularly the tiger eyes exuded by the appearance of the saints in most religious statues. According to him, the first bishop of Manila, Most Reverend Domingo Salazar, O.P., began the education of the Chinese into Christian Doctrine when the Dominican missionaries replaced the Augustinian missionaries in 1587. The Binondo Church, built in 1596, was actually the third church to be erected in a series of construction, the first being constructed in Parian, dedicated to the three Holy Kings, another in Longos, dedicated to the Purification of our Lady. During the 1896 revolution, the Dominicans relinquished the church to the seculars which, after a few years, could not handle the influx of Chinese coming from the mainland. This is the reason why there are two back-to-back parishes within the area - the first being the Binondo Church itself and secondly the Binondo Chinese Church. Fr. Sierra laughs in optimism when I ask how the two parishes get along together and he responds both churches exist in harmony. Tagalog mass is only held in the main church but Chinese mass is conducted the Chinese Church as part of indoctrinating pure Chinese immigrants from Mainland China and orient them about Christian living. But the Chinese Binondo Church celebrates mass in three languages in English, Mandarin, and Amoy or Fookien. Religious syncretism often takes place when foreign beliefs are introduced to an indigenous belief system and the teachings are blended. The heterogeneous religion then takes a shape of its own. In this case, Buddhism and Confucianism are foreign beliefs blended with Catholic dogma as the indigenous belief system, and when merged, it forms a unique religious practice. The said shrine is sacred among the Chinoys here to show the importance of religious syncretism, originally erected in Ongpin Street in 1984, now it stands majestically along Tomas Pinpin Street. Though the site is sacred along a busy street, it also magnifies its touristic appeal, carved off and is installed with a golden cross of five feet in height and four feet width. It has a candle stands but beside the corners it has cylinders filled with joss sticks or incense. As I observe, Chinoys and some local and foreign tourists light candles and burn incense at the same time before they say their prayers before the golden cross. Despite considered a Catholic Shrine, the fusion of cultures seems obvious, and religious syncretism highlights the faith of the people in Binondo. Lesson # 3: The Catholic faith is very strong in Binondo regardless of the heavy Chinese influence observed in the area. It is common knowledge that the Chinese have been converting into Christianity, most notably Catholicism, since colonial periods. Religion, specifically Catholicism, could be considered a neutral ground as we enter the world of Binondo. As we leave Binondo at dusk, I have simple reflections or perhaps questions that could be answered or only time can answer it. What if the Chinese did not come to the Philippines? I think that would be impossible because of early trading and migration in the past which is innate to every nationality. Many Chinese migrated to the Philippines as paupers but now many of them have become financially blessed and few are becoming tycoons undeniably occupying very significant positions in the capitalist economy of the Philippines. Then, why Chinoys are rich and prosperous compared to other ethnic groups in the Philippines? Scholars like Go Bon Juan would claim that the ethnic Chinese were never, by nature, businessmen but it was historical conditions which pushed them to play the role of businessmen in the Philippines. For me, Binondo shall remain special at the heart of Manila’s economic miracle; its cultural richness will enliven brightly as Chinese New Year in the country is annually celebrated; religious syncretism will flourish as a fusion of various faiths continuously grow; and local politics shall become the training ground for most Chinoys to expand their political clout and influence in the national political scene.